姜辰龙, 严秀文, 张日腾, 李勇, 姜平, 白娟. 猪圆环病毒3型LAMP检测方法的建立与应用[J]. 畜牧兽医学报, 2018, 49(6): 1314-1319. JIANG Chen-long, YAN Xiu-wen, ZHANG Ri-teng, LI Yong, JIANG Ping, BAI Juan. 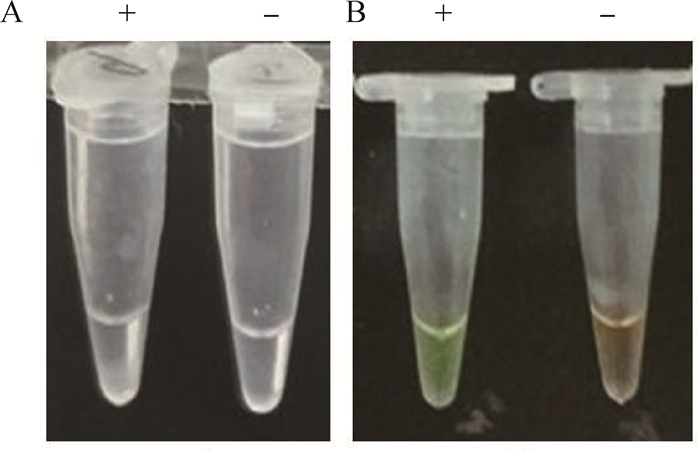 Establishment and Application of LAMP Method for Detection of Porcine Circovirus Type 3[J]. Acta Veterinaria et Zootechnica Sinica, 2018, 49(6): 1314-1319. Abstract: In order to diagnose and detect porcine circovirus type 3 (PCV3), in this research, specific primers were designed according to the conserved sequence of ORF2 gene. 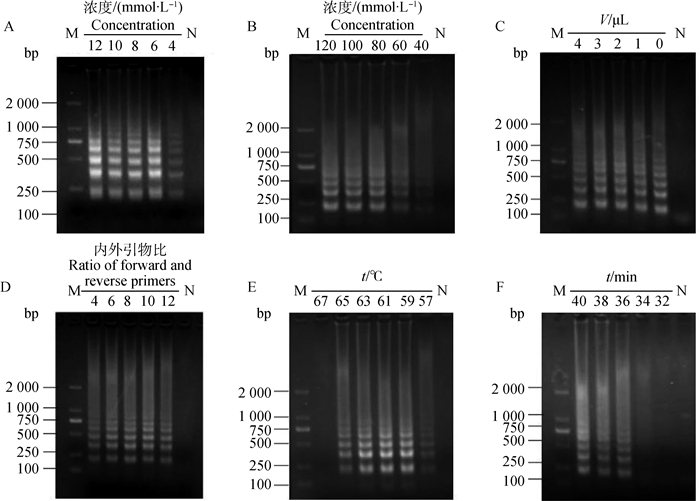 By optimizing the concentration of Bst DNA polymerase, the ratio of primers, Mg2+, dNTPs, betaine and reaction condition, the loop-mediated isothermal nucleic acid amplification (LAMP) was established. 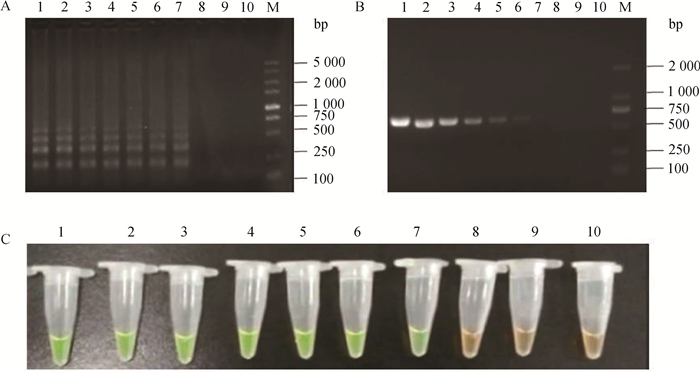 The results manifested that ladder strips were observed after 36min with a constant temperature, and the product could be judged by SYBR Ⅰ staining. The detection limit of this way was 1.0×101 copies·μL-1 which had no cross reaction with porcine reproductive and respiratory syndrome virus (PRRSV), porcine pseudorabies virus (PRV), classical swine fever virus (CSFV), porcine circovirus type 1 (PCV1) and type 2 (PCV2). From 68 lymph nodes of diseased pigs in respiratory system, the positive rate of 30.9% tested by LAMP had a high coincidence rate of 95.6% (65/68) with that by PCR detection. Compared with traditional technology, this method is more sensitive, simpler and can be used for detection and clinical diagnosis of PCV3. PALINSKI R, PIÑEYRO P, SHANG P C, et al. A novel porcine circovirus distantly related to known circoviruses is associated with porcine dermatitis and nephropathy syndrome and reproductive failure[J]. J Virol, 2016, 91(1): e01879–16. 陈伯祥, 杨明, 常亮, 等. 环介导等温扩增技术在动物传染病诊断中的应用进展[J]. 动物医学进展, 2012, 33(4): 90–96. 湛洋, 王东亮, 王乃东, 等. 猪圆环病毒3型检测及其Cap结构序列和抗原性预测分析[J]. 畜牧兽医学报, 2017, 48(6): 1076–1084. 黄火清, 郁昂. 环介导等温扩增技术的研究进展[J]. 生物技术, 2012, 22(3): 90–94. 戴婷婷, 陆辰晨, 郑小波. 环介导等温扩增技术在病原物检测上的应用研究进展[J]. 南京农业大学学报, 2015, 38(5): 695–703. 庞笑语, 王建昌, 韩庆安, 等. 河北省猪群中检出猪圆环病毒3型[J]. 中国动物检疫, 2017, 34(11): 70–73.